"Looking for a mirror in Inverness ?" "
"Mirrororworld have 1000's of mirrors and years of experience delivering mirrors to the whole of the UK including Inverness, We Supply and manufacture mirrors for the home and work place, whether your looking for a simple mirror for your bathroom, a cheval for the bedroom or a statement mirror for the lounge, Mirrorworld are the one stop mirror resource. With 1000's of ready made mirrors to choose from and an award winning made to measure service, it's easy to find that desired mirror here at mirrorworld. Check out our online store or try one of our free quote tools for a perfect custom made to your exact requirements. With a nationwide delivery service you really don't need to look further for a beautiful mirrors at a great prices." "Mirrorworld are the experts when it come to mirrors for Inverness, large or small, framed or unframed, customised and made to measure, we do the lot, whatever your needs look no further. check out our extensive on line catalogue or one of our free online designer tools, we know you'll find the perfect mirror for you. With free delivery anywhere in the UK mainland on orders of £50 your perfect mirror is just a few click away." 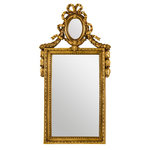 PR031 Just one of the great selections from our Antique range of mirrors and accessories. A stunning feature on your wall, the ornate rectangular wall mirror will reflect light and style into your room while adding a regal touch to the decor. A stunning feature on your wall, the ornate rectangular wall mirror will reflect light and style into your room while adding a regal touch to the décor. Made from durable and strong Polyresin, the mirror features a beautifully carved detail at the top of the frame, with a small oval mirror in the middle, giving it a look of grandeur and elegance. The rectangular frame also features decorative detail further enhancing its regal look. An antique gold finish helps to accentuate the dramatic contours that will appear to shimmer in the light. A stunning focal point in your bedroom, dining room, hallway or living space, the ornate wall mirror will add a touch of glamour to your decor. At Mirrorworld we pride our selves in delivering quality mirrors and services throughout the UK, including Inverness. 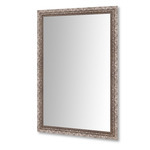 LF055 Just one of the great selections from our Classic range of mirrors and accessories. Beautiful 120mm Wide Silver with Ochre Leaf finish to provide that vintage look. This stunning decorative Italian Designed framed mirror has a wide frame and creates the perfect focal point in any room. This mirror comes with fixings for landscape or portrait hanging and can also be leant against a wall. 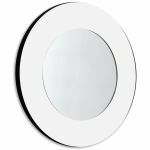 DR010 Just one of the great selections from our Contemporary Designer mirror range of mirrors and accessories. Modern and stylish contemporary mirror. An essential decorative piece for the fashion-conscious home-owner, this white and glossy acrylic framed glass mirror is a thing of understated beauty that brings out the best in a contemporary lounge, bedroom or hallway. Manufactured in our own workshops here in the UK you're guaranteed this exclusive design will add quality and style to any decor. Passionate about our products and service, we want to help you make the perfect choice; so, in addition to holding a wide variety of mirrors in stock, we also offer a number of bespoke services. Perhaps you are looking to whet your artistic appetite or for our professional creative input; MirrorWorld’s accomplished craftsmen will work closely with you to create your own personal design, by hand at our workshop and deliver it to your Inverness home.